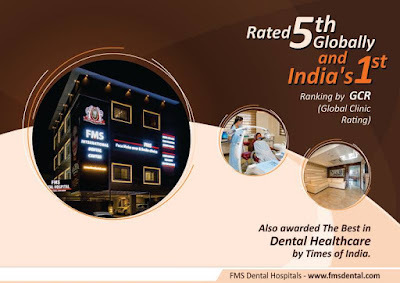 FMS Dental Hospital: Best Dental Clinic in Koti, Hyderabad, India. This center is probably the only true dental hospital in the country, with in-patient beds, ICU, operation theatre, conscious sedation facility, and CBCT scan. FMS Dental Hospital, Koti established in the year 1994 in an ample area of 10,500 Sq. Ft. is located on the bank street. It is unique in having 24 hour emergency services and state-of-the-art operation theatres to perform maxillofacial surgeries including facial trauma, orthographic surgeries, cleft lip & palate, most advanced zygoma implants etc. The center has got 14 electrically operated dental chairs with in-house full-fledged radiology department that includes Cone Beam CT scan (KODAK cs9000), Digital OPG & Ceph and RVGs. Dedicated Implant ology department with Physio dispensers, Piezo surgery units & various special surgical equipment’s to place different implant systems from Nobel Bio care, Alpha Bio, AB, MIS, IDHE DENTAL (KOS, BOI, BCS) are available in this center. Other Special equipment’s are Bio LASE from water LASE, Diode LASER from SKANRAY, DIAGNOdent, surgical microscope etc. More than 15 specialists from various specialties’ of dentistry, 6 general dentists & dental hygienists are available between 9 a.m. – 9 p.m. in this hospital. It is recognized referral hospital for the employees of Central Government of India, State Government of Telangana and Andhra Pradesh, police department of Telangana & Andhra Pradesh (Arogya Bhadratha) and 30 more public sector employees. Great article you had shared.Thanks for sharing such kind of information.Thank You!